Sour bacuri is grows wild in native to dry land forests of Amazonian region in Tropical South America from Mexico to Peru. 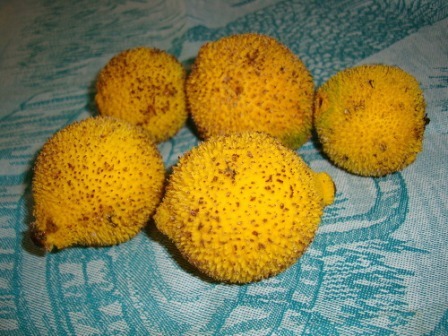 Though it is not an orchard fruit and collected from wild only, yet it is highly commercialized. A glabrous, polygamodioecious tree, to 9 (20) m tall, less than 15 cm dbh; outer bark very thin; inner bark reddish; wood hard; sap yellow, in branches and trunk. Petioles 1-2.5 cm long, somewhat swollen at base with a short appendage on the inner side above the articulation; blades elliptic, acuminate, mostly acute at base, 7.5-22 cm long, 2.5-8 cm. wide, the midrib often arched; lateral veins and submarginal collecting vein visible on both surfaces (prominulous above when dry). Fascicles axillary, sessile, often at leafless nodes; pedicels slender, usually 2.5-3.5 cm long (rarely shorter); sepals 2, rounded at apex, ± united at base, ca 3 mm long; petals 4, nearly orbicular, to 7 mm long, creamy-white, strongly reflexed at anthesis; bisexual flowers with fewer stamens than the staminate flowers; style short; stigma discoid, as broad as or broader than ovary. 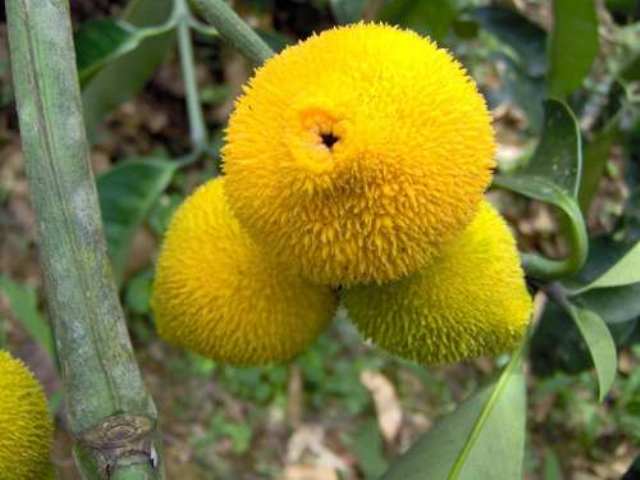 Fruits ovoid to globular, often weakly flat­tened, to 5 cm long and 4 cm wide, yellow, densely cov­ered with puberulent, flattened protuberances to 3 mm long; exocarp thick, moderately hard; mesocarp thin, sweet; seeds usually 2, longer than broad. 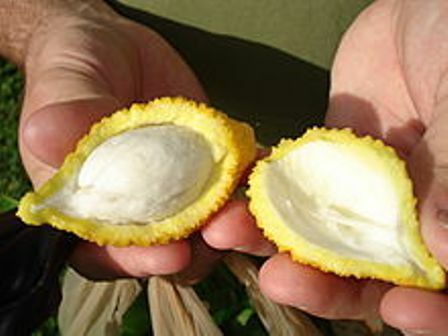 As stated earlier, Sour bacuri fruits are collected from the wild only and this fruit has not yet been brought under cultivation. One may, however, find specimen trees of this fruit in botanical gardens or collections.